Cimon Art is an Australian artist, best known for his sculpture series, titled “Little Love Stories”, built of LEGO bricks coated with various material and adorned with Swarovski crystals. 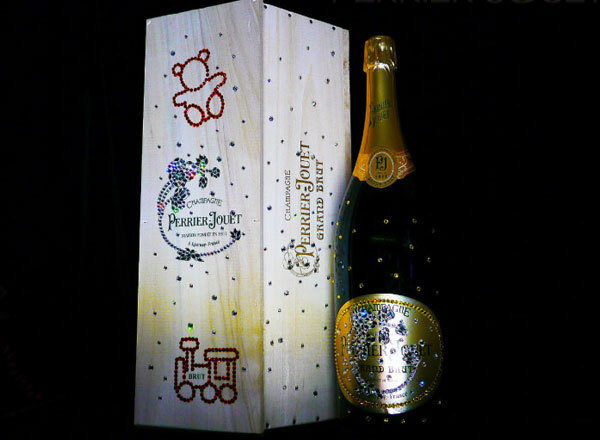 Now, this talented artist was invited by renowned champagne house Perrier-Jouët and Status Luxury Group (SLG) to convey his skills of designing on a bottle of its famous Grand Brut, special for the Celebrate Your Status gala auction on December 17, 2012, to benefit Petra Nemcova’s Happy Hearts Fund (HHF). Now in its 2nd year, the Celebrate Your Status Gala produced by SLG hopes to raise $20,000 and 2,000 toys for HHF. Swarovski crystals are conspicuous everywhere, from the bottle itself to its wooden case. 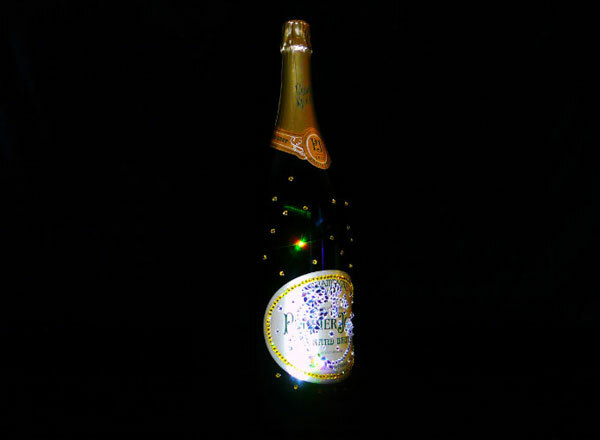 Cimon used it to emphasize recognizable Perrier-Jouët anemone on the face of the case, which also boasts motifs of teddy bear in fire orange crystals and a toy train engine in fire-red crystals. 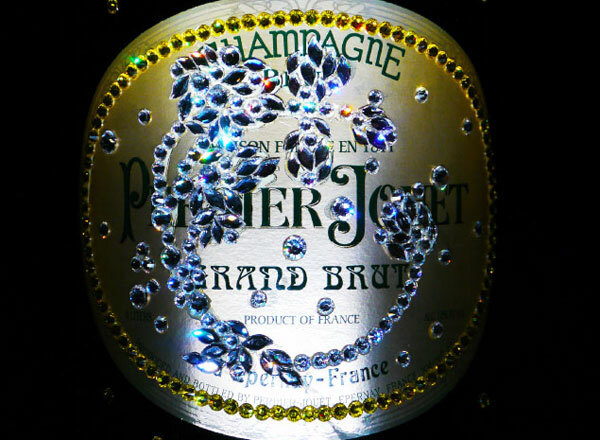 The entire case is adorned with crystals of different sizes and shapes, giving it a spirit of celebration and holiday. 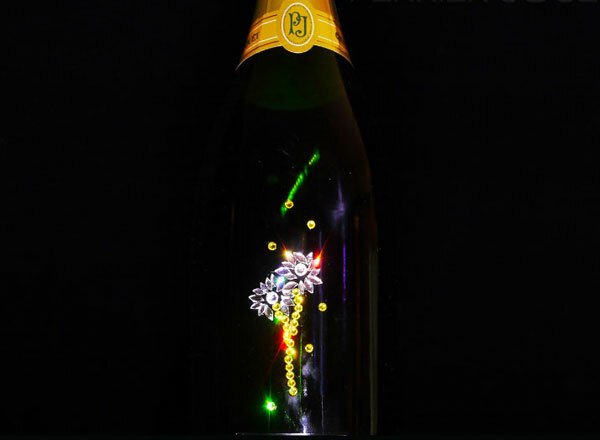 On the label of the bottle, there is repeated flower motif in clear petal crystals, which is surrounded with pale yellow crystals, while a clear crystal flower with a golden stem adorns the back of the bottle. 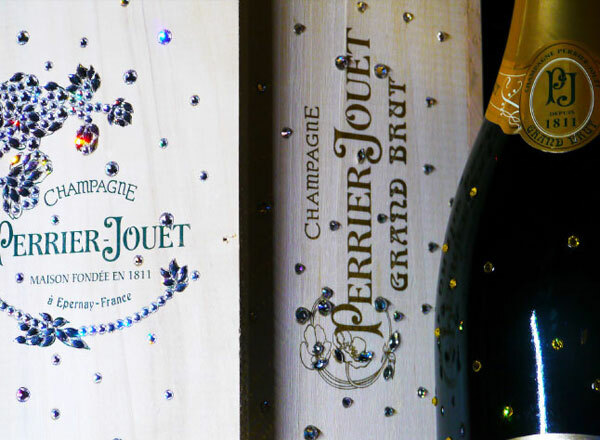 3 liter botlle of Perrier-Jouët Grand Brut, adorned with Swarovski crystals also boasts Cimon Art’s signature. Happy Hearts Fund (HHF) is a nonprofit organization dedicated to rebuilding schools and to restoring hope and opportunity in the lives of children after natural disasters around the world.